The model by which seven new hawker centres are run by social enterprises is generally sound in spite of issues with its implementation, Environment and Water Resources Minister Masagos Zulkifli said. He told Parliament yesterday that his ministry has heard the feedback from Singaporeans, and will continue with the scheme, but adjust it to better serve patrons and look after hawkers' well-being. "As with any trials and experiments, we cannot always get it right the first time," he said. "Give the model time to adapt, adjust and optimise the outcomes we seek to achieve," the minister said. These outcomes include affordable good food, a decent living for local hawkers that is sustainable, and preserving hawker centres. Mr Masagos and Senior Minister of State Amy Khor fielded 19 questions from MPs on these socially conscious enterprise hawker centres (SEHCs), which have recently come under public criticism for imposing unnecessary rules and an extra layer of costs on hawkers. The National Environment Agency (NEA), which regulates hawker centres, has also stepped in to address these concerns. Dr Khor told MPs the agency will rebalance its approach and exercise greater oversight to safeguard hawkers, saying: "We set some key parameters, let the market work, and when we get feedback or issues are raised, we will move to address them swiftly and decisively, as we have done in the past month or so." Mr Masagos said new operating models were needed to sustain the hawker trade after the Government resumed building hawker centres in 2011, after a hiatus of nearly 30 years, to stabilise prices of cooked food. "This is why we are trialling the SEHC model for our new hawker centres," he said, explaining that SEHC operators bring new ideas and inject innovation that hawkers or the Government cannot. They are able to curate food stalls for quality and variety. They can bring in famous food recipes, and are better placed to run programmes to draw younger hawkers and help sustain the trade. They also innovate to improve footfall and enhance the vibrancy of the centres, he said. And as operators with competencies in food and beverage (F&B) and management, they can help hawkers weather the competition from other F&B alternatives and adapt to technological disruptions, better than the hawkers can on their own, Mr Masagos said. 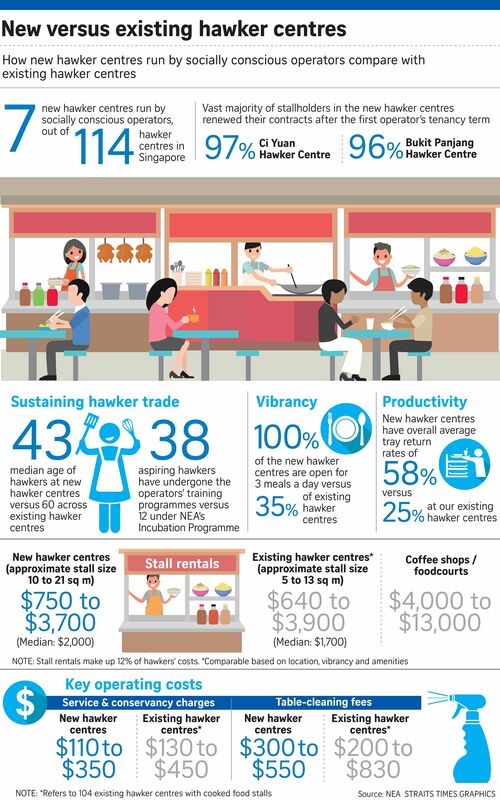 While he was heartened by the recent public debate on how existing hawker centres managed by the NEA appear better run than SEHCs, he said: "It is not enough to keep doing things the same way." He noted that on the whole, SEHCs have achieved good outcomes: Food prices are affordable and comparable with existing centres, operators have curated stalls for quality and variety and kept their centres open during breakfast, lunch and dinner, unlike at older centres. Hawkers are also doing well, he said, citing the new Bukit Panjang and Ci Yuan hawker centres, where 96 per cent and 97 per cent of them renewed their contracts respectively. "The market mechanism is working, and the Government should not intervene unnecessarily, in mandating low or no rental," he said. Hawkers are entrepreneurs after all, he added. "We want to reward successful hawkers to sustain the trade and preserve our beloved hawker heritage. It is natural to have some level of churn as better hawkers replace those who are less suited for the trade," he said. "It is inappropriate for the Government to subsidise a hawker on the basis that business is poor. This would be unfair to a better-performing hawker who thrives on healthy competition," he said. Six MPs pressed Mr Masagos and Dr Khor for further answers, including Ms Lee Bee Wah (Nee Soon GRC) who asked why the NEA could not just run hawker centres itself, and Mr Liang Eng Hwa (Holland-Bukit Timah GRC) who asked whether the social enterprise model was the only way to go. Dr Khor reminded members that the new model "is really in its infancy", and still evolving. She added: "We're open to any model because the idea is to benefit Singaporeans, to benefit hawkers."